Welcome to our main Awards issue for 2018. Once again, a big thank you to all of our readers for your thousands of nominations and votes, making this year the most voted awards since we began in 2011. We need to congratulate all of our winners as the voting in every category was extremely close. We also need to thank our sponsors Aon Remetrica for their sponsorship of Actuary of the Year and Bolton Associates who sponsored the GI Actuary of the Year. 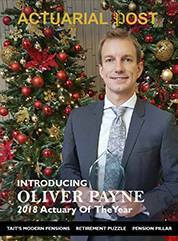 Actuary of the Year 2018 goes to Oliver Payne from Ford Motors. GI Actuary of the Year is Nick Betteridge from Canopius. 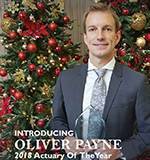 Pensions Actuary of the Year is Steven Leake from XPS Pensions Group. Investment Actuary of the Year goes to Michelle Darracott from Smart pensions. Life Actuary of the Year is Greg Lugisani from Mercer. Employer of the Year is KPMG. Recruiter of the Year is Star Actuarial Futures. I hope you enjoy reading all of their responses inside. May we all take this opportunity to wish you all a very merry Christmas and a happy New Year and I look forward to welcoming you all back in 2019.